MANILA – In the light of Malacanang’s amnesty to rebel soldiers by virtue of Proclamation No. 50, the Samahan ng Ex-detainees Laban sa Detensyon at Aresto (SELDA), an organization of former political prisoners, today aired their demand for the release of all 378 political prisoners in the country, saying this is a political decision which should be exercised by the President, as much as the amnesty for the rebel soldiers is a political act. “While we welcome the intent for the freedom of the rebel soldiers, we are adamant in demanding for the immediate and unconditional release of all political prisoners. They do not need amnesty, since almost all of them were charged with trumped-up and fabricated common crimes while they were persecuted for their principled opposition to various anti-people policies. They are demanding for their freedom,” Fr. Dionito Cabillas, SELDA Secretary General, said. Cabillas cited the case of the forty three health workers who were illegally arrested, tortured and detained since February 6, 2010, among the several cases of political prisoners. 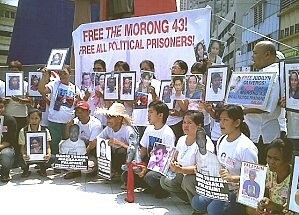 “There has been no let-up in the international community’s appeals and demand for the release of the Morong 43. Pres. Aquino should now decisively make a political act by releasing the Morong 43,” Cabillas added. According to data from Karapatan and SELDA, under the Arroyo government, there were 2,425 victims of arbitrary arrests, 1,092 of them were tortured. Among these cases are that of political prisoners Myrna Cruz and Randy Malayao, both detained in the Cagayan Valley Region. Cruz, a former teacher and a consultant of peasant organizations, was illegally arrested last March 2010 and has remained incarcerated at the Tugeugarao City Jail, despite state prosecutors’ orders for the dismissal of murder charges and her release. Malayao, a consultant of the negotiating panel of the National Democratic Front of the Philippines (NDF), was acquitted from murder charges filed against him for the killing of former Cagayan governor Col. Rodolfo Aquinaldo and his aide, but he remains detained at the Ilagan City Jail in Isabela. “Both Cruz and Malayao have suffered unjustly for crimes they did not commit, and yet no attention has been given for their eventual release,” Cabillas said. SELDA also called for the withdrawal of fabricated charges against activists and leaders of progressive organizations such as former Bayan Muna Rep. Satur Ocampo and NDFP consultants Vicente Ladlad, Rafael Baylosis, and Randall Echanis. “These charges, which have been consistently proven false, are pure harassment and persecution of Ocampo, Ladlad, Baylosis, Echanis and others, for their political beliefs. The continuing spate of trumped-up charges against human rights workers in Negros, Bicol and Mindanao indicates that these practices continue,” Cabillas ended. TACLOBAN CITY – Leyte Governor Carlos Jericho Petilla confirmed the attendance of dignitaries coming from the Allied Forces and from Japan to the 66th Anniversary of the Leyte Gulf Landings on October 20. Among those who confirmed their attendance to the commemorative program were the representatives of the United States of America, Australia, Canada, New Zealand and Japan, Governor Petilla, who underscored that this year's commemoration have been kept simple but significant, informed. The good governor added that the attendance of Honorable Samuel B. Bagasin has also been confirmed. Honorable Bagasin is the Undersecretary for Civil, Military, Veterans and Reserve Affairs of the Department of National Defense. The visitors from Australia will be led by Mr. Andrew Byrne, Minister and Deputy Head of Mission of the Embassy of Australia. Canada will be represented by Mr. James Trottier, Counselor for Political and Economic Section, Embassy of Canada. No less than His Excellency Andrew Graeme Matheson, Ambassador, Embassy of New Zealand, will arrive in Leyte to grace the 66th Leyte Gulf Landings commemorative program. In order to extend Japan's message of solidarity, His Excellency Makoto Katsura, Ambassador, Embassy of Japan will once again grace the Commemorative Program. His Excellency will be accompanied by Colonel Yuki Matsuzaki, Defense Attache, Embassy of Japan and Mr. Yoshino Hirosato, Secretary of the Ambassador. The representatives of the United States of America will be Ms. Leslie Basset, Deputy Chief of Mission, US Embassy and Mr. John Skelly, Director, Manila Regional Office, US Department of Veterans and Affairs, Embassy of the United States. The Leyte Gulf Landing Anniversary commemorates the successful liberation by Allied Forces, of the Philippines from Japanese occupation during WWII. 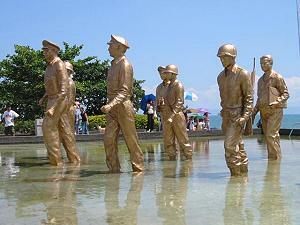 The celebration remembers the return of General Douglas MacArthur and his men who landed on the shores of Palo, Leyte. General MacArhtur had been forced to retreat from the islands two years earlier by advancing Japanese forces at which point he valiantly vowed: "I shall return". The landing preceded the Battle of Leyte Gulf on October 22-27, 1944 that involved more than 739 ships in what is considered as history's largest sea battle. TACLOBAN CITY – A Regional Photo Exhibit and Competition will be staged on October 18 to 22, 2010, at the People’s Center and Library, sponsored by the Provincial Government of Leyte, with the Department of Tourism Region 8 and the Camera Club of Leyte and Samar cooperating. “This is in line with the 66th Anniversary of the Leyte Gulf Landings to honor once again foes and friends alike who strove hard to attain peace and promote harmony among the people of the world,” Director Tiopes said. The activity coincides with the 4th Leyte Province Business Month celebration which focuses, among others, on the Tourism sector as a vehicle to propel the socio-economic growth of the Province of Leyte, Region 8 and the nation as a whole. The exhibit will feature the works of professional photographers as well of winning entries of the amateur photographers, Director Tiopes added. Meanwhile, Ms. Trina Dacuycuy of DOT 8 informed that the Competition has three categories. The first category is dubbed as Uniquely Leyte which is an open category to include landscape, still life and portrait that showcases the uniqueness of the Province of Leyte, Ms. Dacuycuy said. The second category is the Heritage Structures which include photographs of houses, buildings, monuments in Eastern Visayas that have been inexistence prior to World War II. At stake are attractive cash prizes and trophies, Director Tiopes said. MAASIN CITY, Southern Leyte – It’s official. The gathering of adult scouts nationwide has been finally scheduled this month, on October 22-28, 2010. The activity, which will be held at the sprawling Danao Forest Park here, will also be the occasion for One Visayas Boy Scouts jamboree. This was revealed on Tuesday by Mayor Maloney Samaco on the sidelines of the pinning of ranks ceremony for CAFGUs into enlisted army reservists at the city gym. Samaco said he expected some 5,000 visiting scouts, boys and adults, to converge to this week-long event, which was set to happen in the Scouting Month of October. Told that the dates covered with the holding of barangay and Sangguniang Kabataan (SK) elections on October 25, Samaco said the coincidence had to be accepted since no other dates were allowed by the Department of Education (DepEd) as these days have no classes, being a semestral break. In the city-paid, block-time radio program on Wednesday, Samaco disclosed he would allow the participating Rover Scouts to get back to their respective barangays to vote on election day. Samaco said he also expected Vice-President Jejomar Binay, the National President of the Boy Scouts, to be around to grace the opening ceremonies on October 22, a Friday. Since last year, the City government has been preparing for the holding of the rover scouts meet, seeing the activity as an occasion to showcase the city’s tourism potentials and boost the local economy. It was first scheduled in May but was put-off because of the automated polls, then moved to October since there was widespread talk the barangay and SK polls would be postponed. TACLOBAN CITY – In a bid to curb the perennial problem of timber poaching within its area of jurisdiction, the Community Environment and Natural Resources Office (CENRO) Sta. Rita, Samar has intensified its information campaign on the importance of forest conservation and protection. Led by its CENR Officer Forester Pierre C. Gillo, a community assembly was recently held in Barangay Tinabanan, Marabut considered as one of the hotspots of timber poaching within Samar province. The assembly brought together the barangay chairmen and other leaders of barangays Tinabanan, Legaspi and Tagalag all of Marabut, Samar which are considered by the Department as timber poaching hotspots. Also in attendance were representatives of the Philippine National Police and the Philippine Army as well as the municipal government of Marabut, Samar. “The barangay assembly was conducted mainly to increase the awareness of the communities on biodiversity conservation and to empower them by providing updates on national laws relevant to protected area management and biodiversity conservation,” CENR Officer Pierre Gillo said. This is also consistent with the DENR direction “From the Ridges to the Reefs” being espoused by Regional Executive Director Primitivo C. Galinato, Jr. This recognizes the need for the protection of the forest areas as an important ecosystem. “Whatever happens to the forests will surely affect the lowland ecosystems,” Gillo added. During the assembly, they were given information on the Salient Features of Forestry Laws particularly Presidential Decree 705 with its amendments, as well as the Chainsaw and Wildlife Acts which are being implemented by the DENR. Since the forestlands of Marabut are within the Samar Island Natural Park (SINP) which is a declared Protected Area, the participants were also given information on the importance and significance of conserving the resources within that area. While timber poaching has become a source of livelihood for some in Marabut, particularly in barangays Legaspi, Tinabanan and Tagalag, CENRO Gillo is optimistic that this can be minimized, if not totally eradicated. He encouraged them to avail of alternative programs being offered by government such as the Community Based Forrest Management Program. Through the CBFMP, organized communities are given a tenure instrument through the CBFM Agreement which gives them stewardship of a given area for twenty five (25) years, renewable for another term. Through this, the organization may go into agro forestry as an alternative to timber poaching, while conducting forest conservation and protection activities. “I hope that you will share with your constituents whatever we have shared with you today. Our responsibility to protect the forest is for the common good,” CENRO Gillo told the participants in Marabut. He further challenged them “to protect our forests now, or we may one day wake up without any more forests to show our children”. CENRO Gillo revealed that they have also conducted a similar barangay assembly in Guirang, Basey for the three (3) hotspot barangays of Inuntan, Mabini and Guirang. The conduct of the barangay assemblies aims to address the issue on rampant timber poaching, kaingin and charcoal making, wildlife hunting and trading in these areas. 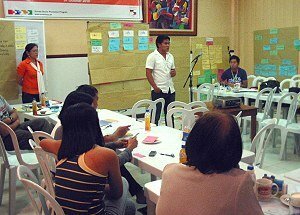 CATBALOGAN, Samar – At least 20 participants of a DTI-GTZ facilitated workshop held in Catbalogan, Samar on October 7 identified the creation of a Tourism Council as a priority in Tourism Industry Development Program (TIDP). This was the consensus reached by participants, representing both the public and private sector, in a participatory deliberation using the COMPASS process in evaluating the TIDP implementation. It would be recalled that both the Tourism Industry Development Project (TIDP) and the Business Permits and Licensing System (BPLS) were the two main projects that were identified during the previous Local and Regional Economic Development (LRED) Planning conducted by the local government unit of Catbalogan through the support of the Department of Trade and Industry (DTI) and German Technical Cooperation (GTZ). “The compass workshop, as the term literally means, is a monitoring and evaluation tool that would tell us where to go, what has been done, and measure whether what has been done was in line with what has been previously designed. It is intended to align strategies, track progress on action plans, define critical success factors and the future activities,” explains DTI Officer-in-Charge, Ms Meilou Macabare. The workshop focused on developing Catbalogan as a world class tourist destination by harnessing and protecting its environmental capacities. During the discussions, the individual roles of the various stakeholders in achieving its vision were properly delineated. Concerns, such as tourism sites inventory, budget, information materials, tourism office, facilities, human resource development, infrastructure and an active tourism council were listed down as important factors to be considered. In so far as what has been done to promote local tourism is concerned, the group was unanimous in saying that much has already been done, but its impact was not very much felt by the local populace and was not successful in inviting more tourists. A necessity to revisit the critical success factors, which were identified, was suggested. As its next doable steps to tourism promotion, the group will be lobbying with the Local Chief Executive for the immediate creation of a Catbalogan Tourism Council through an Executive Order. This will ensure the appointment of a Tourism Officer who will oversee the Tourism Office and its functions. Furthermore, it is expected that the Local Legislative Council will ultimately pass an appropriation ordinance, where funds will be allocated for the sustainability of the project. The LGU was proud in announcing that despite the lack of funds on tourism promotion, Catbalogan got nominated in an OTOP national competition. News features on the tourism potentials of Samar has been published on local and national television networks. Business wise, increased bookings on hotel accommodations and increased daily trips of transport services are positive indicators of a growing tourism activity in the area. However, in the sharing of experiences, Ms. Charo Cabardo, a critic and a respected resource person recalled having read a newsletter which was published in the 1980s. Somebody was quoted to have said, “Don’t dilly-dally there, there’s nothing in there!” Ms Cabardo recalls the statement to have meant that Catbalogan is not a good place to visit. According to her, sanitation laws are not properly implemented, thus, markets, terminals, public parks and places are dirty. “These are deterrents in promoting tourism activities in the area” she adds. The concern was well noted and will be properly indorsed during a meeting with the local leaders. CATBALOGAN, Samar – To strengthen the campaign against insurgency in the region, the 8th Infantry Division has deployed a battalion of government troops in Samar on Monday. In a press release penned by one LtC Noel A Vestuir (GSC) PA it said that Major General Mario F. Chan, Commander of the division that the 87th Infantry (Hinirang) Batallion, under Lt Col. Leo Lorenzo Madroñal after an organizational training is now prepared to pursue of what has been left in the CPP/NPA remnants after the troops incessant operations and overrunning of camps. To recall, 87th IB was created in April and immediately underwent training in Brgy Erenas, San Jorge, Samar. Aside from the rigorous training, the troops mission-essential equipment have also been fortified through modern and high tech equipments in warfare as part of the army’s modernization program. Some of these are K3 crew-served weapons, Squad automatic weapons, 90 millimeter recoiless rifles, mortars, grenade launchers, sub-machineguns, harris radios to name a few. 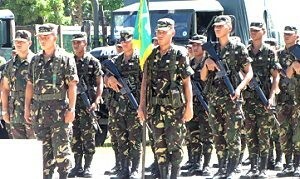 With all these in place, Chan believes that the battalion is ready to help the government end insurgency in the region. 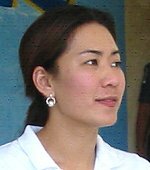 In a simple send-off ceremony on October 11, 2010, Chan stressed the need to uphold human rights not only that of the civilians but even captured ‘enemies’ of the state or ‘prisoners of war’. Recently, some 16 camps of the CPP/NPA have been found in the tri-boundaries of Samar island. A series of encounters also took place between the insurgents and government troops. The most recent of which was the encounter between some elements of the 34th IB underi 2nd Lieutenant Collado and some ten members of NPAs in Barangay Gusa, San Jose de Buan, Samar some 2 days ago. No casualties were reported however, but the troops think that the rebels have ‘immersed’; themselves in the area. MGen. Chan noted that despite the diminishing strength of the ‘enemy’, he ordered a no let up operation on the pursuit of the rebels. He however added that the government is ready to welcome those who will change their minds in favor of the state. 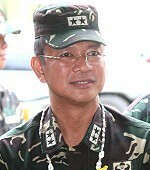 CATBALOGAN, Samar – The commanding general of the 8th Infantry Division MGen. Mario Chan urged Samar Governor Sharee Ann Tan to hasten the construction of roads, bridges and power to Samar’s remote barangays to discourage insurgency. Speaking before the Provincial Peace and Order Council Meeting on Friday, October 8, 2010, Chan also solicited the synchronized implementation for projects to usher development in the area. He recounted that the army has discovered a camp by the insurgents located in the tri-boundaries of Samar provinces, particularly, Las Navas (north) Jipapad (east) and Matuginao (west). The government troops have discovered that the Central Party Committee of the CPP/NPA has been camping in Samar Island. Although Chan admitted that there are but a few of the rebels left including their arms, still he believes that the army alone can never solve the problem. The army chief also recommends that local leaders must take a strong stand against CPP/NPA. The insurgency problem, he believes needs a highly coordinated and synchronized response from all government entities. Further, he stated that the army needs additional troops particularly the return of the 43rd Infantry Battalion and the 46th Infantry Battalion that have been deployed to Mindanao. Chan, like former 8th ID Chief Arthur Tabaquero also hailed Bohol and Cebu for being able to fizzle out the flames of insurgency. He urged the local government to increase/expand the ‘mobility corridors’ for them to pursue insurgents so that peace and development can truly come in. BORONGAN, Eastern Samar – The local government unit (LGU) of Borongan is set to file a temporary restraining order (TRO) against a mining firm which is allegedly extracting the top soils of several northern barangays: Siha, Maypangdan, Tabunan, Tamoso even Bugas. Municipal Administrator, Dayan Agda stood firm in his statement to this writer, that this mining firm did not seek the permission of Borongan LGU in regard to its operation which to his information had been on-going since May 2010. “We are filing a case against this mining company,” Agda confirmed over the phone. Similarly, the Provincial Legal Office of the Province, thru Mr. Victor Apura denied any knowledge about the extracting operation being done along the outskirts of Borongan. The information trail followed Department of Environment and Natural Resources’ (DENR) pronouncement on air through Radyo ng Bayan DYES, that such activity is on-going in these barangays, with the residents unknowing of the hazard it poses their environment even to their future. Information Officer, Dorinda Labro informed that some residents are paid P220 a day to extract the top soil around them, by the mining operators. “But the residents do not know the name of the Mining firm,” Labro said. She appealed particularly to the residents of barangay Siha and San Saturnino (Takyang) where, there are currently paid labors, to understand the consequences when their top soil would all be transported to far America (as reported). “Wara ta na pagtatanman, kay milyon ka tuig it at huhulton antis hibalik an sugad nga kadamo han tuna nga nawara”, cautioned Dorinda. [We would have nowhere to plant on, as we will have to wait for million years, before we can restore the same volume and fertility of our soil]. She also stressed that, if we will have to make clay out of stones, that would be hardest and most difficult. Speaking from the spiritual view, Dorinda said, that the minerals we see from under the ground are all God’s gift to mankind and a Land Title, if somebody had to argue, entitles him only to harvest what are on top of the ground and not those from underneath. Some information reaching the office of Mr. Agda said that these soils are extracted for exploration purposes; they are being tested either for confirmation or otherwise, for rich mineral reserves in the Borongan perimeters. However, the staunch environmentalist strongly argued that any mining firm must not pursue an activity as it is damaging to mankind. BORONGAN, Eastern Samar – At least four persons had been arrested and one caliber .45, one caliber .38 and a home-made shotgun with 13 assorted live ammunitions were confiscated by the Eastern Samar Police Provincial Office (ESPO) in the implementation of the election “gun ban”. The ESPO report indicated the arrest of one Paquito Oculana y Noroña of Oras Municipal Police Station on September 25 for illegal possession of caliber.38; Sgt. Diego Luan Coranez, of the 546th Engineer Brigade, Borongan, arrested on Sept. 27 due to possession of caliber .45; Joey Lingan y Amores of San Julian on Sept. 30 for possession of home-made shot gun and Fred Barsana, Gen. McArthur, Oct. 6, for possession of home-made shot gun. The report added that a total of 345 checkpoints have already been conducted and is still on-going on a 24-hour operation on different strategic locations in every municipal police station, until the “gun ban” order is terminated on November 10.